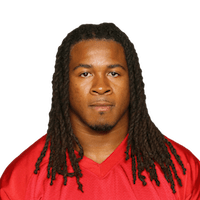 Published: Oct. 7, 2018 at 02:06 p.m.
Atlanta Falcons running back Devonta Freeman explodes through running lane for 20-yard gain. Published: Jan. 13, 2018 at 08:22 p.m.
Atlanta Falcons quarterback Matt Ryan escapes two tackles attempts from the Philadelphia Eagles to convert on a 6-yard touchdown pass to running back Devonta Freeman in the NFC Divisional Round playoff game. Published: Jan. 6, 2018 at 10:22 p.m.
Atlanta Falcons running back Devonta Freeman churns through defenders for 22 yards. Published: Jan. 6, 2018 at 09:18 p.m.
Atlanta Falcons running back Devonta Freeman channels Beast Mode on a powerful 3-yard TD run.